In a Nutshell: Modern businesses depend on data and analytics to understand customer engagement and build successful relationships that result in repeat customers and larger sales. Como understands the importance of this data and uses it at the core of its Como Sense program that works within POS systems. 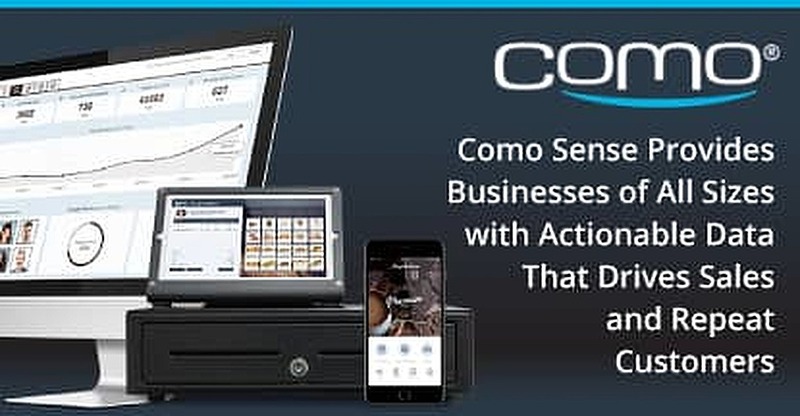 Como Sense provides businesses with a branded mobile app, a wide choice of loyalty programs, actionable business insights, and marketing automation that give business owners and managers deep insights into customer habits. The program is already working globally for brands like Carl’s Jr., Quiznos, and Burger King, which saw a 30% higher average spend per visit for loyalty program members compared with nonmembers. Not too long ago, hungry lunch-goers who frequented delis and other restaurants would cling to cardboard punch cards that recorded purchases with the goal of eventually getting a free meal. Often, when a customer redeemed a full card for a free sandwich, the cashier would stuff it in the register and eventually throw it away. The cards worked to drive some return business but provided little insight into which customers were coming back and which were simply losing their cards. Loyalty programs like this have made monumental leaps into the digital age by integrating with POS systems to gather customer information about purchase history, loyalty rewards, and payment information. Customers are no longer required to hold onto punch cards or loyalty account numbers and business owners are rewarded with advanced analytics that provide detailed information on important segments of their customer base. A leader among POS integration services, Como partners with more than 75 POS companies to enable its Como Sense solution to deliver essential tools — a branded mobile app, a wide choice of loyalty programs, actionable business insights, and marketing automation — that work together to deliver the right incentives at the right time. “Our vision is that we want to provide small- to medium-sized restaurants and retail chains with the solutions that are normally only available to the online giants,” said Yair Holtzer, Founder and SVP of Como USA. Como Sense is currently integrated within the POS systems of thousands of small- and medium-sized businesses throughout the US, the UK, and Israel. The company also partners with major brands, including Burger King, Quiznos, and Carl’s Jr., to run customer engagement activities that drive larger sales and repeat customers. Five years ago, businesses that did not have a website were considered less than legitimate. Today, the same can be said for mobile applications. Consumers now look to apps to find store information, shop and pay for products, or stay updated on company happenings. But the development and upkeep of apps can be tricky and expensive as technology changes and new cellphone models adopt different screen sizes, resolutions, and display standards. As part of the Como Sense solution, client businesses are given access to their own branded app that customers can use to shop, store loyalty information, or make payments. Como’s customer research has found that its loyalty program offerings not only improve return customer traffic but increase individual and long-term purchase totals with those returning customers. Among the statistics Holtzer noted was a 30% higher average spend per visit for loyalty program members compared with nonmembers. Loyalty program members’ monthly purchase frequency also increased by 48% and the monthly spend rose by 41%. Como partners with global businesses and brands of all sizes to offer solutions that increase sales and customer engagement. Como Sense is used as the driving force behind the loyalty program for one of its most known clients, Burger King. The brand launched two targeted campaigns in October of 2016 with the goal of increasing repeat sales through rewards that provided value, but not freebies. In addition to doubling the number of purchases made by members compared with the previous month, the campaigns also brought more than five times the number of new members into the program. The first campaign offered each member a Double Whopper for the price of a Whopper. The second campaign rewarded members with a digital scratch card with every purchase that revealed a coupon that could be redeemed on their next purchase. To receive a bonus, a customer would have to make a purchase — which brought in more sales for Burger King. Aside from the increase in profits, the platform also collects and sorts vast amounts of data related to customer engagement and behavior with a brand. These deep customer analytics track what customers are buying and what they’re paying, it can also compare individual customers and regions or locations to analyze the busiest times of day at specific locations. “By researching this information, you can look at specific members or customers and reward them for purchases or loyalty outside of your general marketing,” Holtzer said. Personalized experiences are important to the modern consumer, many of whom are already accustomed to scanning their faces to unlock their phone, or using a fingerprint to unlock a door. Most expect a similar tailored experience as shoppers — especially regular ones — who spend their hard-earned money at a store or restaurant and want some sort of perk for their patronage. Como Sense provides a powerful package of solutions that help business owners and managers gain key insights into customer habits to increase repeat customers and drive larger sales. Many loyalty programs are available to business owners to ensure those customers remain happy and loyal to an establishment, but few are equipped with the kind of backend data that educates the business on their customers’ wants and needs. Como compiles this information in its Como Sense solution to give businesses a branded app, the tools for omnichannel communication, marketing automation, and a loyalty program equipped with a wealth of options for retaining their best customers. Business owners and managers have access to analytics that shows customer engagement with a brand, average purchase information, and other actionable data that has proven to increase return shoppers and improve sales volume. A loyalty program created by Como Sense is a big departure from traditional punch-card loyalty programs that provide little information about customers and their habits. Instead, this type of loyalty program meets modern customers where they already are — on their mobile devices.